The demands of industry in terms of its cleaning needs far outweigh any domestic requirements both in their scope and in the challenge they often present. In the environments associated with healthcare, pharmaceutical manufacturing, food processing and large retail operations, the required standard of cleanliness alone is often far beyond anything than can be achieved in the home with the domestic strength devices at the homeowner’s disposal. Other industries may experience soiling and contamination that could be hazardous to workers. Only the power of industrial cleaning equipment is sufficient to meet these challenges. Industry’s clean-up tasks often involve large areas and, frequently, only a limited time in which to complete them. The tools for these tasks are typically far more powerful than their domestic cousins and, because of their size will often need to be self-propelled. In this category, both walk behind and ride-on units designed for various cleaning tasks such as sweeping, scrubbing and polishing offer the ideal means to provide the high standards required and to do so quickly. 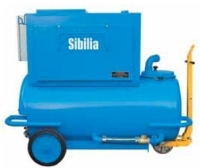 Industrial-strength dirt may need extra-tough measures on occasions and high pressure washers and steam cleaners will often be the most effective solution while also being useful for penetrating those less accessible areas that are prone to gather detritus. Accidental spillage is a constant possibility in many industries and can result in health and safety risks unless quickly and thoroughly removed. High power vacuum units are available to cope with all manner of materials including thick sludge and even inflammables. In this respect, vehicle mounted units offer the means to deploy the facility quickly to wherever it may be needed, especially in outdoor locations as the vehicle also provides power to the unit. In summary, today’s range of tools designed to meet the cleaning needs of industry is extensive and has applications in hospitals, banks, hotels, airports, railway stations, manufacturing plants, power stations, shopping malls and even on the high street. This entry was posted in Industrial Cleaning Equipment and tagged Cleaning Equipment, industrial cleaning equipment by admin. Bookmark the permalink.